It is often said that prostitution is the oldest profession. This is not true, and I know this with a very high degree of certainty. For a prostitute to subsist, there must be a medium of exchange, and for a medium of exchange to exist — even in terms of barter — there must be a surplus of production (i.e. a person is producing more than they can consume). Thus, there must be pre-existing productivity, for example food that has been hunted, or gathered or grown, tools that have been created, etc. The truth is that prostitution (or perhaps soldiery) is probably the oldest service profession. What is a service profession? Well broadly there are two kinds of professions: goods-producing, and services-producing. Goods-producing professions produce things. Services-producing professions do things without producing any definable goods. Prostitution is a very good example. So is legal work, consulting, lobbying, graphic design, sales work, soldiery, musicianship, acting, etc. And yes — while I feel that writing creates a good — it too is widely considered a service. 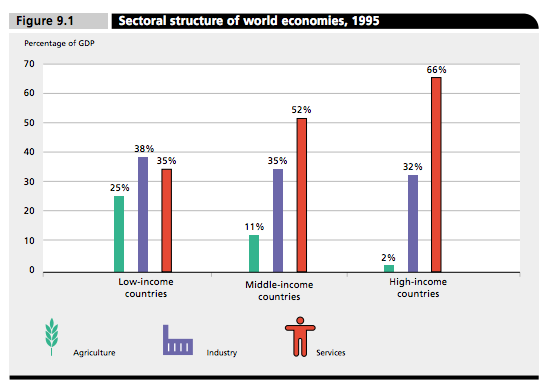 At present, the Western economies are dominated by services. The private sector by itself won’t, and can’t, undertake structural transformation of the magnitude needed—even if the Fed were to keep interest rates at zero for years to come. The only way it will happen is through a government stimulus designed not to preserve the old economy but to focus instead on creating a new one. We have to transition out of manufacturing and into services that people want—into productive activities that increase living standards, not those that increase risk and inequality. Now I’m not accusing Stiglitz of anything other than a misplaced zeal for fixing the American economy. His suggestion is merely emblematic of a wider misconception. Service jobs come into existence as there are bigger surpluses of production. In an isolated national economy, the services sector will only grow if the productive sector grows in proportion. But in a global economy, with flows of trade and goods, illusions are possible. Imagine the centrally-planned society of War-is-Peace-Land, occupying one half of a large island, and led by an absolute King. The kingdom is very successful in warfare, and maintains a great advantage over its sole neighbour. 50% of its working subjects are conscripted into the military, in various roles — soldiery, tactics, smithing, horsemanship, etc. Of the other half of the population 30% work in collective agriculture, 10% work in light industry (e.g. making candles) and 10% are personal servants to the King (or in the case of females part of his large harem). Now, the King does not like the fact that his harem is not as large as it could be; he does not like that there are women and girls toiling the fields when they could be in his harem. Nor does he like that there are men toiling in the fields when they could instead be conscripted into the military. Fortunately in the neighbouring kingdom of Productivity Land, they have huge surpluses of agriculture and productivity, as only 30% of their population is conscripted into the military, while 40% work in agriculture, and 20% in light industry. As they make such huge surpluses, they are willing to make up for any shortfall in War-is-Peace-Land. As a result of this, more and more workers in War-is-Peace-Land can be moved from agriculture to serving the King, either as a manservant (carrying his Royal chair, beating up anyone who insults him, tending to his elaborate gardens) or as a member of his harem. In return for this, the King sends promissory notes — which are often promptly lent back — from Productivity Land to pay for their products. Productivity Land uses this money to acquire natural resources from other islands. Eventually, the King decides that his pleasure gardens need to be greatly expanded, and so he moves the entire non-military workforce out of agriculture, and into manufacture terra cotta and bronze statues, to decorate his pleasure gardens. Of course, War-is-Peace Land has built up a humungous debt over the years, and Productivity Land feels short-changed in sending its productive output across to the other half of the island in exchange for increasingly-devalued pieces of fiat paper that buy increasingly less and less resources. But the King of Productivity Land is very smart. He recognises that winning a military confrontation with War-is-Peace Land will still be difficult, so he agrees to continue this arrangement so as to make War-is-Peace Land even more deeply dependent upon the produce of Productivity Land. One day, the King of War-is-Peace Land was out frolicking gaily in his pleasure gardens, smoking his pipe and contemplating a lazy afternoon molesting his harem. Alas, no. A messenger from Productivity Land arrived at the Palace to inform him that Productivity Land was sick of his devalued fiat currency, and so would no longer send agricultural products or other produce. That was it — War-is-Peace Land had no intent to pay back their debt, so they were out in the cold. “Nonsense!” cried the King, and promptly had the messenger arrested, tortured and killed. He rallied his generals, and declared war against Productivity Land. Alas, they did not get very far. It took three days for the army to be rallied together into a fighting force, and by that time War-is-Peace Land was running low on food and fuel. Armies — no matter how well-equipped — cannot march on an empty stomach. The tired and weary soldiers of War-is-Peace Land were more numerous and better equipped, but their hunger and subsequent tiredness got the better of them and they were massacred and beaten back. The King tried to escape, but was captured by Productivity Land’s forces and promptly executed. Readers can read whatever they like into the above story; it is purely fictitious, and of course massively simplified. But I think it captures the essence of the problem of outsourcing your productivity to foreign lands who might not always be as friendly as they appear to be today. The bottom line here is that any proposals regarding transitioning to an economy even more dependent on services assumes that goods and productivity will keep flowing into the West, even though there is no guarantee of such a thing. Governments in the West would do better to worry about the West’s (lack of) energy and resource independence. This entry was posted in Economics, Musings, Philosophy, Politics, Wall Street, War, What is Money? and tagged common misconceptions, devaluation, energy independence, government, interest on excess reserves, keynesianism, krugman, newt gingrich, obama, prositution, resource independence, romney, service economy, stiglitz, war is peace. Bookmark the permalink. I think this is the crux of the problem: “illusions are possible”. “Services” wouldn’t be so much of a problem as long as they’re correctly priced in the global economy. But if the financial system gets out of control, coupled with easy money policies, “illusions are possible”. Other problems remain of course, like that of outsourcing vital parts of the country’s needs to possibly future enemies. To add something, things can get even more insidious with “correctly” pricing services. Even if “correctly” priced, the “correct” price may exhibit wilder fluctuations leaving more vulnerable a country whose economy is farther from producing things of unequivocal value. Other problems remain of course, like that of outsourcing vital parts of the country’s needs to possibly future enemies. In the next decade, I think that will be the problem we need to worry about. We shall see, though. We shall see. I think Aziz has grasped a lot of hidden things that were bubbling under the surface, which are really very obvious once you realize they are there, like the Chinese endgame of kicking America off reserve currency welfare. Yeah, it’s obvious once you think about. That narrative was pretty hilarious. Couldn’t agree more. And when the serrvice sector becomes parasitical, we have “Management from Hell,” as far as society is concerned. See my little book on this subject: How Financial Investor Logic Hijacked Firm Governance, at Boosyzone Editions. A huge service industry is not just a post-industrial society, it’s a deindustrialized society, which is an oxymoron. its interesting to map actual cash values to percentages, and even things like calorific values for food. An american corn farmer really does grow 10x what his sudanese counterpart, more like 1000x in reality. Even taking into account higher calorific intakes, theres a limit to how much food an economy wants, can consume or export. Much the same applies to durable goods. A blacksmith forging spades on a anvil, using iron ore and coal surfaced mined with pick axes isnt going to match mass production. But theres only so many spades, or cars, or televisions a country needs. Whats left after that but holidays and meals out? Thats not to say our economies arent out of balance, i know people who complain they cant replace their fridge, but eat out three times a week. And of course, services can be exported. Yeah, via oil or fibre optics. I think the idea of perpetual growth is totally foolish, by the way. The only reason it is really still encouraged is because of our leverage-based monetary system, which devalues debts (relative to GDP) as the years go by. Minor quibble re the hailmaryjane link…fairly sure that pic is of Kapil Dev, a retired Indian cricketer. Heh, I think the point is clear. Regarding the service economy, if you turned your entire economy into the production of Government “White Papers” and “Red Tape” and outsourced it for export income to other countries, would this be an ideal example of a “Top Tier Tertiary” economy? If English is going to be a global language, then the West is well placed to write verbose policy documents in wonkish double speak. A lot of Government workers could not cut it in the real world. Their family is slighly ashamed that they can’t be multi million dollar CEO or Oligarchs, but it sure beats being one of the “Welfare” recipients. But don’t tell them that. They won’t vote to continue the system! “Brevity is wit”. “Keep it simple stupid”. “Common Sense” These mantras should be placed on signs leading into Government capitals. But then what would they do for a living? If English is going to be a global language, then the West is well placed to write verbose policy documents in wonkish double speak. Yes. The West will position itself to do this. The rest of the world will laugh. Shouldn’t transportation be considered a service as well? Depends how you define “transport”. I would tend to include infrastructure-creation (“indirect” transportation) whereas most economists would not. This is all based on a major assumption that the islands Productivity Land is purchasing resources from makes rational decisions finds some value in the promissory notes. The only value would be to trade the notes for whatever surplus War-Is-Peace-Land can provide which would be protective services from their military. If Productivity Land stiffles War-Is-Peace-Land’s military then the other islands will not find value in the promissory notes. Eventually the whole system collapses on itself and you restart at stage one – everyone is completely independent. A good visual for this is take ten people and stand them in a circle all facing the person in front of them’s back. Now have them all sit simultaneously where they each will be sitting on the person behind them’s knees. Remove one person from the circle during the sitting period (interdependence) and the whole circle collapses. The smartest people will stand up before the collapse gets to them. There will always be a natural pendulum swing of interdependence and independence – the key is just to stay the proper distance ahead of the curve.